Ghee is one of the Basics in the Asian cuisine. Ghee is widely used in Indian cuisine. All over India, rice is sometimes traditionally prepared or served with ghee (including biryani). In Rajasthan, ghee is eaten with baati. All over north India, people sometimes dab roti with ghee. In Bengal (both West Bengal and Bangladesh) and Gujarat, ghee is served with kichdi, which is an evening meal (or dinner) of rice with lentils cooked in curry made from yogurt, cumin seeds,curry leaves, ghee, cornflour, turmeric, garlic, and salt. Ghee is also used to prepare kadhi and used in Indian sweets such as Mysore pak, and different varieties of halva and laddu. Punjabi cuisine prepared in restaurants uses large amounts of ghee. Naan and roti are sometimes brushed with ghee, either during preparation or while serving. Ghee is an important part of Punjabi cuisine and traditionally, the parathas, daals, and currys in Punjab often use ghee instead of oil, to make them rich in taste. Different types of ghees are used in different types of cooking recipes; for example, ghee made from cow’s milk is traditionally served with rice or roti or just a generous sprinkle over the top of a curry or dal (lentils), but for cooking purposes, ghee made from buffalo’s milk is used generally. Ghee is an ideal fat for deep frying because its smoke point (where its molecules begin to break down) is 250 °C (482 °F), which is well above typical cooking temperatures of around 200 °C (392 °F) and above that of most vegetable oils. 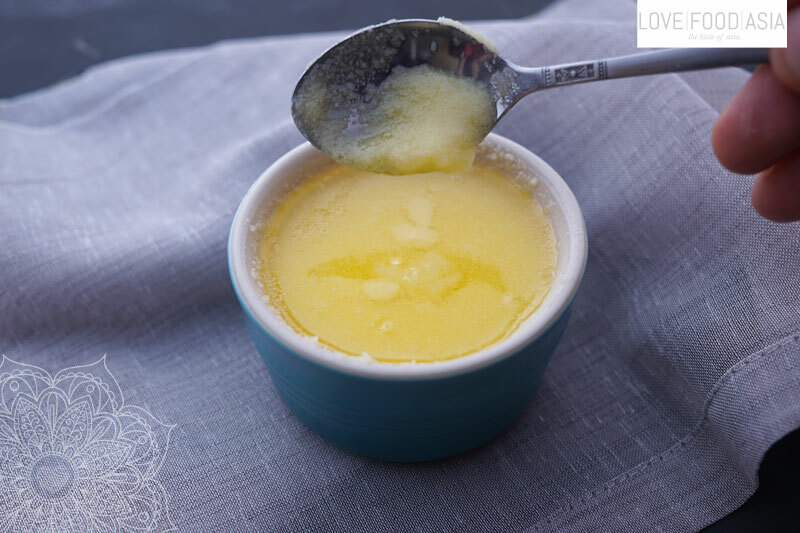 In our simple recipe you can make your own Ghee easily. Melt butter in a pot on 100 degrees (not more). Simmer on low heat for 1,5 hours. Ghee is ready when you can make the fire test. When Ghee is golden yellow remove pot from heat. Use a kitchen towel as a sieve to fill Ghee into bottling jars. Fire test: Take a wooden stick. Dip it into the Ghee and when you can burn the drop of oil the Ghee is ready.